What are the coolest neighborhoods in Cape Town and why? CITY BOWL: This buzzing area of Cape Town sits in the shadow of Table Mountain and Lion’s Head and houses the city’s main commercial district. Few travelers venture beyond its boundaries. But if you take a short drive out of the city center, you will discover an alternative perspective on Cape Town life — one that’s a little grungier, a little weirder, and maybe a little bit more laid back, too. These three areas are some of Cape Town’s hottest up and coming neighborhoods, and definitely worth checking out. Woodstock is a revamped industrial neighborhood associated with bustling streets one which leather backpack-wearing young professionals zigzag between minibus taxis on their vintage bikes. Here, the streets are lined with antique furniture stores and local community members sell rough wooden pieces in pastel shades. It’s a hub for creativity. Design studios, art galleries, advertising agencies, small jewelry shops, artisanal coffee roasters and homey cafes abound. They’re housed in buildings that combine historical architecture and a modern aesthetic, often featuring large graffiti murals. If this sounds like a description of Hipster Paradise, it is. But, Woodstock hasn’t always been like this. It’s an area that’s gone through many phases of transformation, including the current urban renewal taking place. Woodstock is now considered safer, yet there’s also a fragile balancing act between the new developments and the integration of local communities as well as the area’s cultural heritage. The Old Biscuit Mill is one of the area’s biggest draw cards, especially for foodies and design lovers. On Saturdays, throngs of locals and international visitors head to the The Neighbourgoods Market within the Biscuit Mill to feast their eyes and feed their foodie souls on the delicious (mostly artisan) fare laid out at each stall. Everything looks so drool-worthy, that the only issue is choosing what to eat. The best way to tackle this minor issue is to try a bit of everything and loll about in a food coma of happiness. In fact, the latter is almost mandatory. Once you’ve recovered, peruse the other sections of the market. Here you can pick up beautiful pieces including clothing, jewelry, and leather backpacks, most of which has been produced at a high standard by Cape Town’s young creatives. The Woodstock Exchange is another beacon of this area. It is an award-winning space for art, design, business, food and socializing, all of which is underlined by a common theme — creativity. Some highlights include Pedersen + Lennard for leading local furniture design, Rosetta Roastery for coffee made with care, beautiful leather goods by Chapel and the deliciousness that is Honest Chocolate. There are numerous noteworthy spots to get your cultural fix of fine art in this neighborhood like the Stevenson Art Gallery or [CLOSED] WHATIFTHEWORLD . Alternatively, experience the urban creativity of Woodstock by taking part in a guided art walk. Experienced guides lead these tours, during which you‘re invited to explore the area by foot and take the time to learn about Woodstock’s well-loved graffiti murals, both big and small. Graffiti might be perceived as a gritty, underground art form. Yet, in Woodstock each piece has a story and, collectively, the muralists have injected this area with a new vibrant energy and contributed to positive social change. The Kitchen is a cozy cafe that could be the kitchen space of any eccentric homemaker. When the hunger grumps set in (which, in a neighborhood as alive with foodie ventures as it is with graffiti, is certainly guaranteed), their “fabulous salads” and “legendary love sandwiches” will have you smiling again. The Kitchen is cherished by locals (especially during the lunch rush) and is sealed by Michelle Obama’s stamp of approval. The glass facade, industrial-style interior, sunshine yellow couch and delicious coffee of Flatmountain coffee roasters are equally appealing. It’s just a few houses down from The Kitchen. 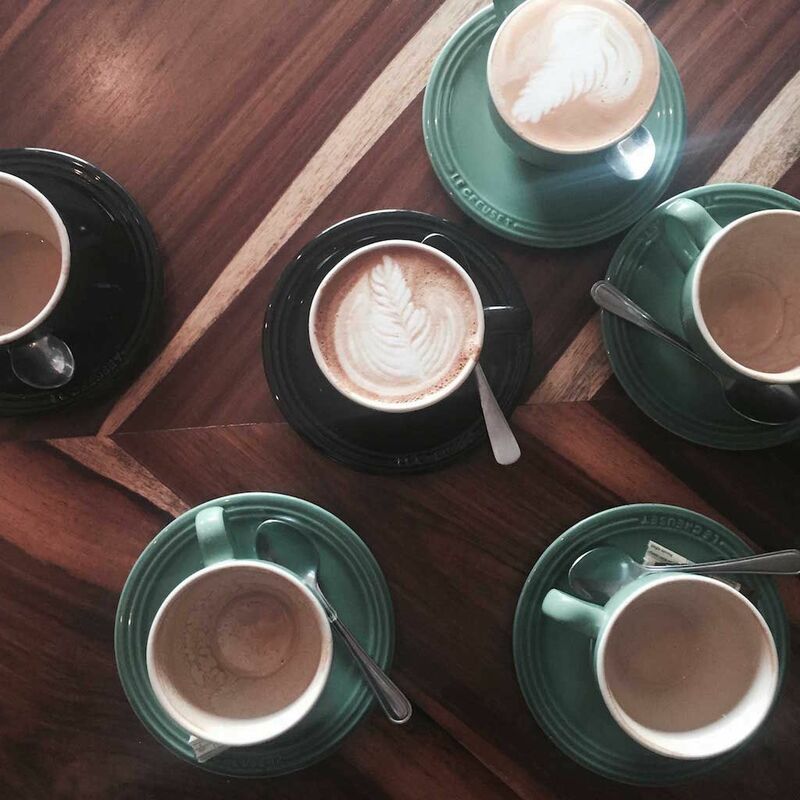 The coffee beans are roasted on site, brewed to frothy perfection and served in cute Le Creuset mugs. Flatmountain coffee roasters. Photo by author. Capetonian bread connoisseurs (we love a good artisanal loaf) go crazy for Woodstock Bakery ’s freshly baked ciabatta, rye, sourdough, baguette, and croissants. These are baked fresh each day using ethically-sourced ingredients and supplied to various spots in Woodstock (like the Neighbourgoods Market, where they fly off the table at a rapid speed, as well as Superette and Saucisse Deli) and other popular venues throughout Cape Town. 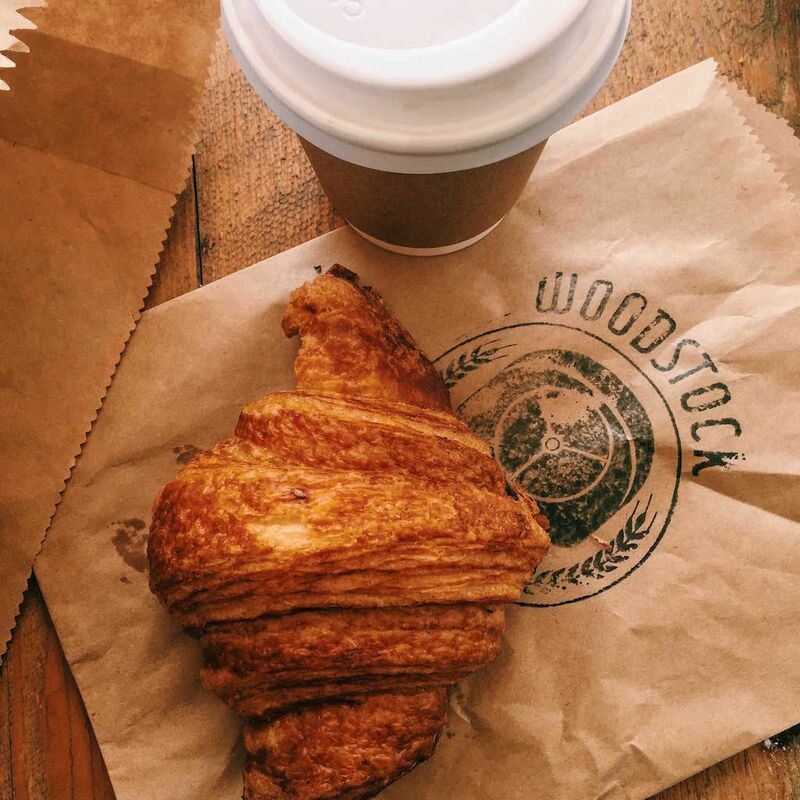 Woodstock Bakery. Photo by author. Post-lunch, delve into Vamp Furniture for retro and upgraded furniture pieces. Or, get happily lost in one of the many local furniture stores dotted throughout the area for interesting antique finds. Dress Me Up is also worth a trawl for vintage clothing. This offbeat neighborhood, named for the South African Astronomical Observatory which was built here in 1972, is more affectionately known as ‘Obs’. Obs is populated by local and international students (due to its proximity to the University of Cape Town), as well hippies, musicians, actors, and everyday homemakers. As a result, the area is an eccentric jumble of different cultures, music genres, schools of thought and creativity and it seems that here everyone is encouraged to just Do You. Obs is a place where you can be yourself and simultaneously take a few risks. It’s weird and it’s refreshing. If you ask a Capetonian city-slicker where to go for live music jams, most will shake their heads in confusion. The reason? Cape Town’s live music scene, especially for young, aspiring musicians looking to perform live for a welcoming audience and gain exposure, lives in Observatory. The Foreign Exchange/Forex, a large space for eating, partying and mingling, epitomizes the diversity of this area and often hosts performances by up and coming musicians. Similarly, the Drawing Room is a café that hosts live music, art exhibitions, and other creative performances. Speaking of jams, Banana Jam awaits for a Jamaican-themed boogie. An international influence is ever present in this neighborhood. Fernando’s is a quirky pizzeria where every detail is imbued with a wacky sense of humor. The space itself is an information-overload (but, in the best way) of styles and colors and prints and textures, where the menu is hand-scribbled and equally (and haphazardly) covered in quirky quotes, illustrations and maybe a dash of glitter-glue. This fantastical pizza wonderland, which serves dishes bursting with that authentic Italian flavor, is not well-known and is found through a tiny doorway on Lower Main Road. True to the all-embracing character of Obs, the restaurants along the Lower Main Road alone feature a range of different cuisines. Sample authentic Ethiopian at Timbuktu, indulge in all things Tex-Mex at Panchos or visit Mr Lin’s for fresh sushi. According to local students, 1890 is another little treasure for sushi. While Obs might feel like a different planet compared to the inevitably cliquey nature of Cape Town; in Obs you can still participate in Capetonians’ favorite activity — brunch. Honeybun, and the Cookie Yard not only have sweet names but are also united by their status as local favorites for a late breakfast. If your sweet tooth is nagging, then treat yourself (because you deserve it) to freshly baked pastries at Queen of Tarts. Kalk Bay is a small fishing village, built on mountain slopes that rise over the rocky outcrops and blue waters of False Bay. Here, a pristine coastline is juxtaposed with a railway line that runs alongside it, appearing at times to teeter just over the water’s edge. The village is a 35-minute drive from central Cape Town and is likened to a more relaxed miniature version. 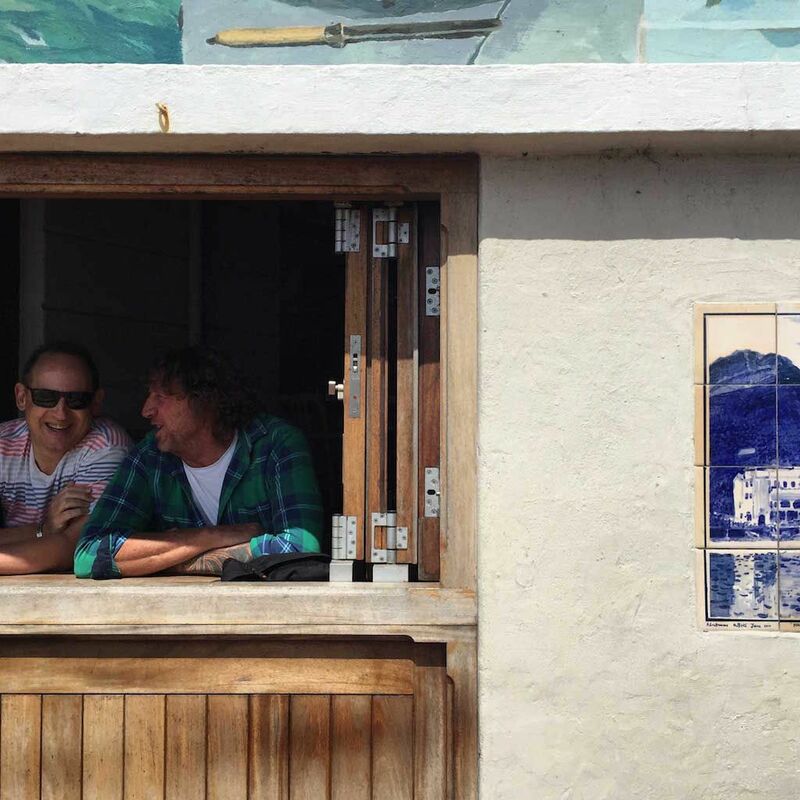 Kalk Bay has the same coastal vibe as Cape Town, but the day goes by at a more leisurely pace, devoid of the pretension associated with a cosmopolitan lifestyle. While Kalk Bay might have a holiday feel, its main street buzzes with a vibrant and happy energy. Much of the activity takes place on this street, or on the adjacent cobbled lanes, so it’s best to simply wonder up and down on foot. This way, you can poke your head in any of the little stores, cafés, and galleries that grab your fancy. Most of these are housed in the bottom level of beautiful historical buildings or within fine examples of Cape Dutch architecture. You’ll surely be enticed by the toasty smell of baked goods emanating from one of the oldest and most well-known establishments in Kalk Bay, the Olympia Café. Sit by the window and people-watch while sipping on coffee and munching on something delish ordered from the chalkboard menu. Or, if you want to grab a treat before continuing your coastal meander, head around the corner to their bakery for fresh artisan croissants, muffins, Danishes and other life-giving pastries. Olympia Café. Photo by author. The Courtyard Café is another spot for (you guessed it) a lazy brunch. It’s wedged between the Aartvark Gallery and the Kalk Bay Theatre, making it the perfect starting point to further explore this creative and culturally-rich village. Speaking of enticing aromas, there’s a certain whiff of fish and chips (but, mostly fish) that constantly lingers on the breeze here. 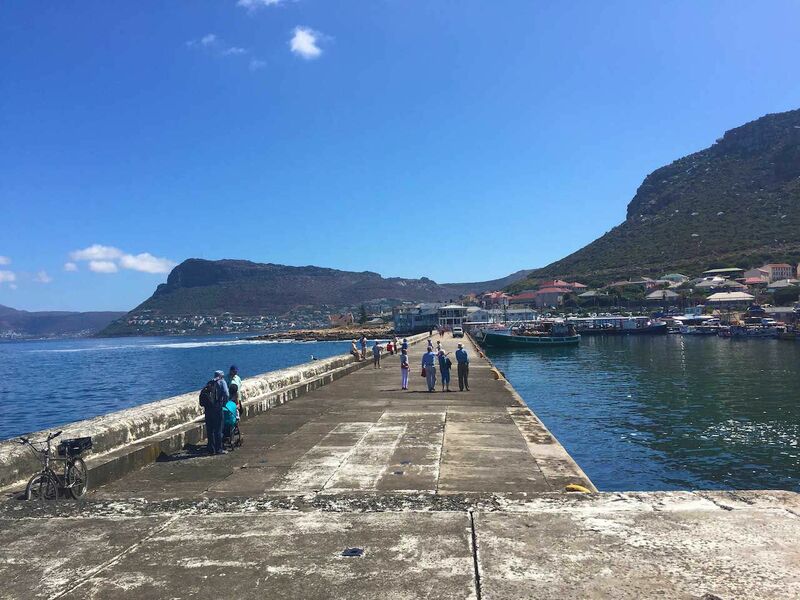 Kalk Bay is a fishing village after all, known for its naturally-formed harbor and the colorful little fishing boats that reflect in the water as they bob up and down over gentle waves. That being said, it would be sacrilege not to indulge in some ethically sourced seafood while you’re in the area. Visit Harbour House for a sophisticated dining experience and panoramic views of the endless ocean, mountains, and Kalk Bay’s lighthouse at the end of the harbor wall. If you’re after a more laid back feel, then settle down for the afternoon at The Brass Bell. 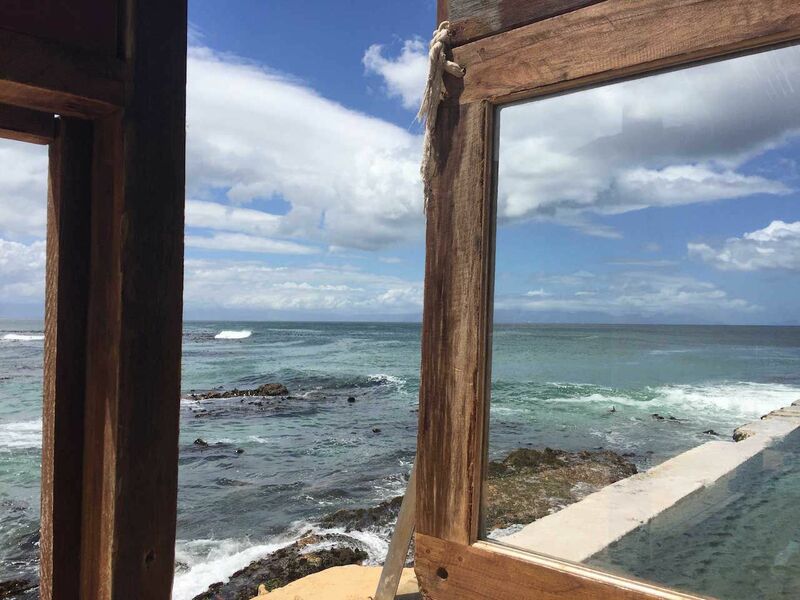 Grab a window seat right next to the water, and be mesmerized by the rising waves as they hit the rocks and splash on the glass. Keep an eye out for all sorts of marine life (including surfers and kayakers) and, if you visit during August and November, you may even catch a glimpse of a southern right whale. The Ice Café is nearby and is the ideal destination for ice cream and sorbet homemade by an Italian family. Their winning recipe has remained unchanged over three generations. The view from the Brass Bell. Photo by author. Established in 1995, Cape to Cuba is another institution of this area, a beach hut with stylistic and culinary references to Che Guevara, Ernest Hemingway, and the Caribbean. It’s always alive with that special party atmosphere, the one that makes you want to stop what you’re doing, grab a (pleasantly strong) cocktail and get merry.